Hi bloggers, well today was a bit of a scary day, my older brother is in hospital with heart problems and it might be a blockage. We always think these things happen to much older people when we are young, then all of a sudden we are older and things start happening to us and the people we love. Anyways I sure hope they find out what is wrong and bro will be back on his feet before I finish this tut. Speaking of this tut, I got all the pics done, put them on disc then had a problem with the disc, so back to putting onto another disc and here we are. Ok you need bubble wrap, not a large piece but big enough to work on your card stock (C/S), a paint brush, paint to co-ordinate with your paper colour, water container to clean brush, paper towel, coloured C/S and or ink pad. For the painters that want to do this make sure you put a small puddle on a palette or plastic lid , dampen your brush but squeeze as much water out of it on the paper towel, you just want the paint to glide smoothly on the bubble wrap and not dripping or this will cause a clumpy mess and too wet for the paper. 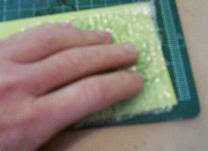 Now smear the paint across the bubble wrap as shown below and cover most of the wrap. Now, press the bubble wrap onto your paper, you don't need a lot of pressure. 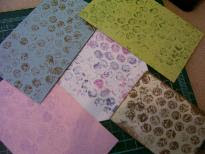 Lift the bubble wrap off and see what happens, you now have a nice texture of circles on your paper. 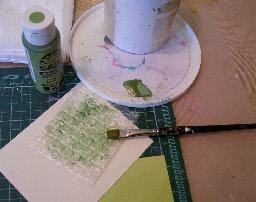 You can't tell here but I have a green paper then I used a Folkart metallic green paint. If you are satisfied with the amount of texture and want to leave some areas not covered on your C/S then you are done. How easy was that? For those that like to use ink, you pretty much do the same thing. 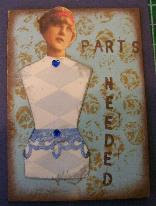 Here I have a nice light blue paper and thought some Tim Holtz distress ink in Tea Dye would look nice and aged. Press the pad on the bubble wrap. (I used a fresh piece for the ink, do not mix, you can wash your bubble wrap off between colours or mediums) . When the bubble wrap is covered with your ink, lay it on your paper and then lift. So here is some blue paper with some tea dye ink, below you will see what I did with it. And here I have done different colours of ink, paint, on various colours of C/S. Mix and match if you like. Use more than one colour and overlap. Just have fun with it. 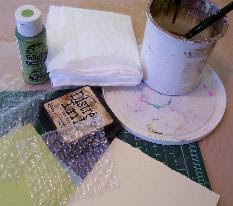 Make some up ahead of time so you have some to play with for cards, ATC's, inchies or a layout for your scrapbook. And here is the ATC I made using the blue and Tea Dye Distress Ink. I wondered after I did this if anyone might be offended with this card and I certainly did not intend for that. When titles come into my head I pretty much look at my art then say that's it. Thanks for coming to see the bubble wrap tut and leave me a comment or show me what you did with yours. Thanks.. quick and easy..looks great.. love the card you made with it too.. I love using bubblewrap! 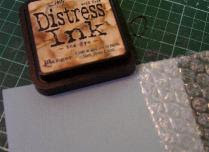 distress ink and bubblewrap should be in everyones studio. beautiful card!